"Okay fellas, this is our moment. Keep a cool head and keep those fingers pumpin', 'cause remember, it's history you'll be writin'." That's right folks, Fat Sam's Gran Slam Speakeasy is re-opening for one-night-only* as we welcome back the stage, the one and only 'Bugsy Malone - SING-ALONG'! A pint-sized cast illuminates this musical that is unlike any other ever made. 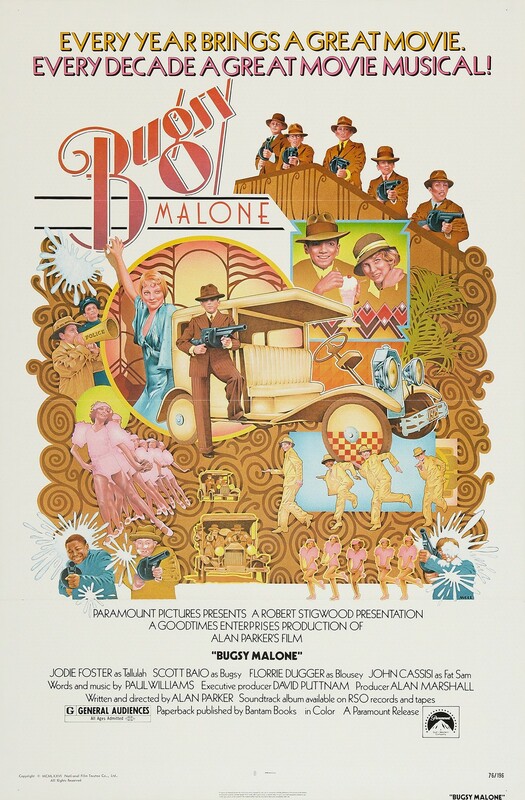 Set in 1929 New York City, Bugsy Malone captures a flashy world of would-be hoodlums, showgirls, and dreamers - all played by child actors! As Tallulah, the sassy girlfriend of the owner of Fat Sam's Grand Slam Speakeasy, future superstar Jodie Foster dances and sings her way into our hearts. Award-winning pop composer Paul Williams wrote the words and music for this thoroughly delightful movie. * - for now, we may add more shows.